Espanola is the southernmost of the islands. Due to its relative isolation it has many endemic species and it’s one of the most popular islands among visitors. Espanola is one of the oldest islands in the archipelago, dating back some 4 million years. The many centuries of erosion have resulted in this being one of the flattest and lowest islands. 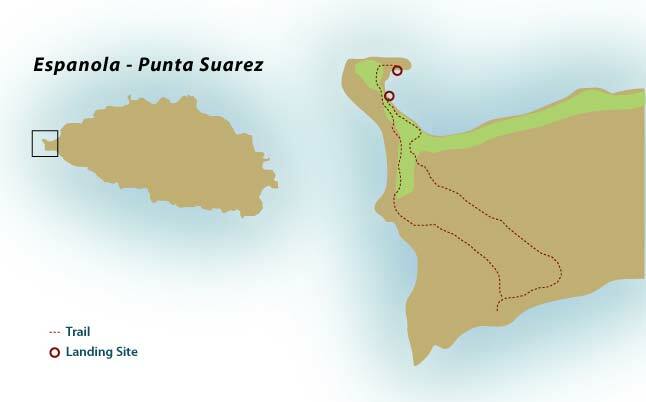 Punta Suarez (wet landing) is one of two visitor points. There’s a coastal trail that leads you past sea lions and marine iguanas. Keep your eyes open for Galapagos hawks, doves, finches and Espanola mockingbirds, the only carnivorous mockingbird in the Galapagos. You should also see Nazca and blue-footed boobies which nest in the cliffs. Turning inland you’ll pass a blowhole and come across a massive colony of waved albatrosses which inhabit the area between April and December to mate and rear their young. 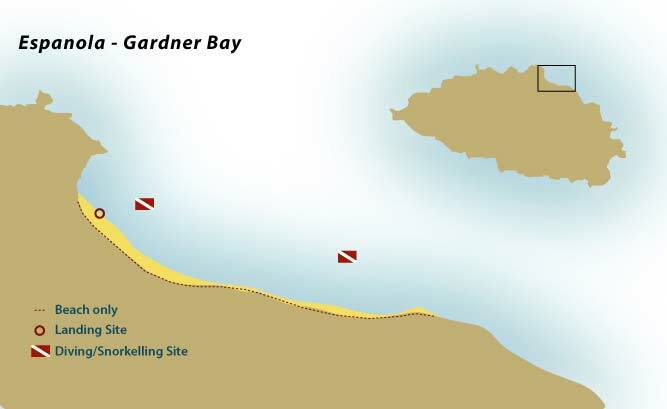 Espanola’s second visitor site is Gardner Bay (wet landing). This long, sandy beach is perfect for relaxing, swimming, snorkelling and kayaking. You may well be sharing beach space with sea lions which also like to laze in the sun while in the sea you may come across turtles. The beach is an open area. Caution should be exercised not to step on sea turtle nests or take earth inland where there is vegetation. It is prohibited to land on the nearby islets on Gardner Island. Maintain safe distance from the sea lions, especially adult males, they can be aggressive.